A resolution that many millennials will love to make is to travel more, to explore the world outside and in the process, explore themselves. 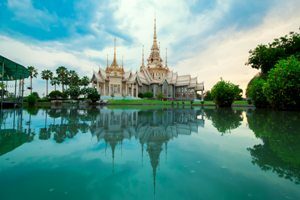 If you’re one of them and are keen on travelling while on a budget, here are five Asian destinations you must visit. Vietnam has been trending as a destination for the last few years among young Indians. The combination of the natural beauty of picturesque hills and tribal villages and the contemporary culture of its modern cities makes Vietnam a compelling destination to explore. Located a few hours away is Cambodia, the country filled with awe-inspiring temples. Though it has modernized, it still has a touch of the ancient that leaves tourists enthralled. Add to that the convenience and cost-effectiveness to travelling to this country from Vietnam by air or even bus, and Cambodia becomes an even more attractive destination. Improved train connectivity has made Sri Lanka increasingly popular among tourists. But this has led to concerns that excessive tourism could drain the country of its natural beauty. If you want to soak the magnificence of this country before it turns crowded, 2019 is the year to visit. A country that ranks high on the World Happiness Index, Bhutan is another destination that has gained popularity among the Indian youth. It’s one of the last surviving Himalayan kingdoms with hidden treasures spread all over. You would be forgiven for believing that this peaceful country is mystically located in the clouds thanks to its altitude, and the ease with which Buddhist traditions mix with newly discovered modernity. Its adherence to traditional crafts like painting, sculpture and archery make it a wonderful escape from the overwhelming Western culture. However, connectivity remains a concern. You either have to fly from Mumbai to Kathmandu and then to Bhutan, or fly to Delhi and catch a flight. Plus, since most travel agents don’t offer flights to this country, you have to book flights on your own through the national carrier’s website, which is a frustrating affair. But this is a small price to pay for the experience you enjoy when you visit the country. Need I say much about this destination? It has been a favourite since long among young travellers across the world. But this popularity has led to the destination getting over-crowded. Thankfully, you have options in form of newer islands like KohLanta and KohPhaNgan, which the locals visit. These are slowly gaining popularity among tourists but will take time to become mainstream. These islands will reward you with the holiday experience you’re badly craving for. I know, this is not an Asian country. But it’s a terrific destination to visit in 2019 nonetheless. Here’s why. Turkey boasts of a mind-blowing culture and architecture. Additionally, with the Lira weakening against the dollar, Turkey has become competitive as far as food and accommodation are concerned. You can enjoy a few days at Taksim Square in Istanbul and other popular locations without burning a hole in your pocket. Flight prices are still a little steep, but once you’ve got that covered, an exotic holiday beckons. The Co-Founder & CTO of Taxidio Travel, Abhas Desai says, “2019 will be a breakthrough year in terms of innovation in the travel industry. Agencies will offer better deals and unique experiences based on your personal preferences. Make the most of them to explore places outside and extend your comfort zone in the process”.